Beyond the egregious building code and fire code violations, the ADU that the city allowed to be built also violates our City's own Historic Preservation Plan - as the city's own ordinance states that these areas are to be preserved and protected. 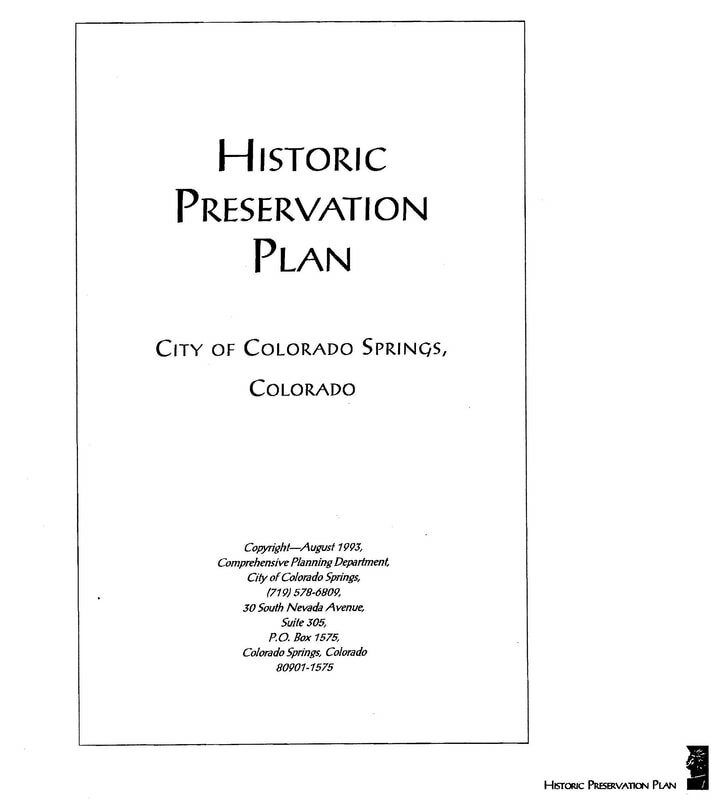 In August of 1993 the City of Colorado Springs published its Historic Preservation Plan. The Westside, a.k.a., Old Colorado City, is an important historic district. Founded in 1859 it was the first capital of the Territory of Colorado. It was here before Colorado Springs (founded 1871), and before Manitou Springs (1872). Old Colorado City was also designated a National Historic District in 1982. 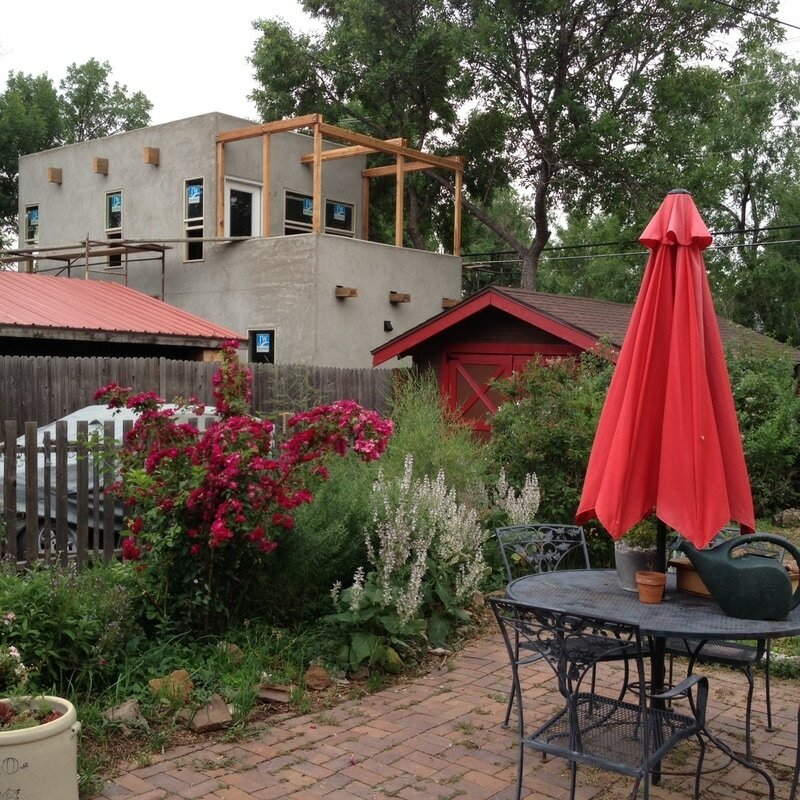 The Historic Preservation Plan lists only five buildings and two areas of special historical significance in the Westside/Old Colorado City area. 2.) Land donated for first state capital (area 2). Our house is located in this 2nd historic preservation area. The Westside Areas of Historical Significance are marked on this map, below. Our street is in AREA 2. This area is of special significance as it is "Land Donated for First State Capital." Because of its historic importance, the City's own Historic Preservation Plan states explicitly that this are is to be protected. This is a close-up of Area 2: "Land Donated for First State Capital." As anyone can clearly see, the 1800 west block of Pikes Peak Ave. is clearly in this area. ​PURPOSE AND DECLARATION OF POLICY. a. It is hereby declared as a matter of public policy that the protection, enhancement, perpetuation and use of structures and areas of historical, architectural . . . significance . . . is a public necessity and is required in the interest of the prosperity, civic pride, and general welfare of the people. (1) Designate, preserve, protect, enhance and perpetuate those structures and areas which reflect outstanding elements of the City's cultural, artistic, environmental, social, economic, political, architectural, historic or other heritage. CONO, which is listed as being involved in the development of this Historic Preservation Plan, was of no help whatsoever to us when we repeatedly reached out for assistance in regard to this illegal building. Andy and our daughter Lily went before The Historic Preservation Board (all board members appointed by City Council) in September 10, 2018. Andy told the board of the fire code and size violations and the disregard of ANSI standards. Not one member, including John Hazelhurst, who has lived on the Westside for years, expressed concern or offered help. Neither our complaint nor our family members' presence was documented in the meeting's minutes. I clicked on "Historic Preservation Overlay Zone." In spite of the roadblock above, I was able to access the City Code: Here it is in its entirety. A. Purpose And Declaration Of Policy: It is hereby declared as a matter of public policy that the protection, enhancement, perpetuation and use of structures and areas of a historical or architectural significance located within the City is a public necessity and is required in the interest of the prosperity, civic pride, and general welfare of the people. 1. Designate, preserve, protect, enhance and perpetuate those structures and areas which reflect outstanding elements of the City's cultural, artistic, environmental, social, economic, political, architectural, historic or other heritage. 2. Foster civic pride in the beauty and accomplishments of the past. 3. Stabilize or improve the aesthetic and economic vitality and values of such structures and areas. 4. Protect and enhance the City's attraction to tourists and visitors. 5. Promote the use of outstanding historical or architectural structures or districts for the education, enjoyment and welfare of the people of the City. 6. Promote good urban and architectural design in new infill buildings and rehabilitation of existing buildings including the preservation of related private and public open spaces. 7. Promote and encourage continued private ownership and utilization of buildings and other structures now so owned and used, to the extent that the objectives listed above can be attained under such a policy. 8. It is the sense of the Council that the economic, cultural and aesthetic standing of this City cannot be maintained or enhanced by disregarding the historical and architectural heritage of the City and by ignoring the destruction or defacement of cultural assets. d. Exemplifies the cultural, political, economic, social or historic heritage of the community. e. Contains buildings which, although individually lacking distinction, collectively display distinguishing characteristics. C. Surveys And Inventories: Surveys and inventories of historic properties have been prepared by the City for downtown, Shooks Run, Old Colorado City, Mesa Springs, Knob Hill, and the west side neighborhood, and such are on file at the Community Development Department. These surveys and inventories as such are now completed or such surveys and inventories as may be completed in the future shall be a part of the City's Comprehensive Plan. Surveys which locate and describe historic structures and areas, and inventories which compile information about historic structures and areas shall be undertaken and updated as funds are budgeted and made available. Owners of surveyed properties shall be notified of the survey results by being given a copy of the survey of their property. A description of the historic preservation ordinance program, the reasons for and the obligations and restrictions and effects of the historic preservation overlay zone shall accompany the survey form. The City survey and inventory system shall be compatible with Federal and State criteria and consistent with Statewide comprehensive historic preservation planning. Both the Regional Building Department and the Colorado Springs Fire Department highly value existing historic structures. Each agency is prepared to survey each building's unique life safety qualities and recommend the enhancements most suited for its individual hazards. Contact either agency to obtain a written comprehensive report. D. Relief To Preserve Historic Resources: The purpose of this subsection is to provide flexibility in the application of development standards and parking requirements for use when strict application of regulations will result in adverse effects to designated historic resources. The City recognizes that historic resources contribute to the unique character of neighborhoods; that many resources exist as legal, nonconforming structures; and that the value of historic resources cannot be replicated once they are adversely altered, moved or demolished. 1. Application: A written request for relief shall be submitted. The request shall include a site plan and a parking lot plan which shows the location, exterior dimensions, and height of all structures and objects, the layout of parking spaces, aisles and access points, and the location and size of the existing vegetation. a. The strict application of development standards listed in the base zone and/or parking requirements listed in article 4, part 2 of this chapter, will cause the removal, demolition or adverse alteration of an existing historic resource. (3) The relief is necessary to preserve the historic resource. c. If the request for relief involves parking requirements, the Traffic Engineer has determined that the surrounding properties will not be adversely impacted by the reduction of the number of required off street parking spaces. d. The intent of this Zoning Code is preserved. (1) The base zone regulations regarding front, rear, or side yard setbacks may be waived upon demonstration that a neighborhood standard exists which is less restrictive than the requirements of the base zone. (2) A recommended waiver of base zone setback requirements shall be no less restrictive than the identified neighborhood standard. (1) The prohibition against backing across a property line may be waived for those parking spaces accessed from an alley if the unparking vehicle is clearly visible from both alley directions. (2) The prohibition against off site parking spaces may be waived for those parking spaces located within three hundred feet (300') of the property containing the subject historic resource, provided that the off site parking spaces are not located across an arterial street, expressway, or freeway. A guaranteed access agreement will be required as evidence of secured off site parking, and it shall be filed with the County Clerk and Recorder if such a waiver is issued. (3) One hundred percent (100%) of all required off street parking spaces may be compact spaces. Compact space dimensions are found in article 4, part 2 of this chapter. (4) The prohibition against tandem parking spaces fulfilling on site, off street parking requirements may be waived. (5) If the relief allowed under this section is still insufficient to preserve the subject historic resource, a reduction of up to fifty percent (50%) of the minimum number of off street parking spaces required by this Zoning Code may be recommended if determined necessary by the Board to preserve a historic resource. (1) The base zone regulations regarding height of building limitations may be waived upon demonstration that a neighborhood standard exists which is less restrictive than the height of building limitations of the base zone. (2) A recommended waiver of base zone height of building limitation may be no less restrictive than the neighborhood standard. 4. Issuance Of Relief: Relief to preserve historic resources may be approved when accompanying an overlay zone change request. As long time residents of this neighborhood (over three decades), as business-owners and tax payers, we deserve to know what is going on here. Why are code violations being ignored, why are historic preservation guidelines being ignored? These issues impact not only our quality of life and our property values, but also those of our neighbors and the historic integrity of this neighborhood and this city.